A journey of thousand miles starts with a single step –so says a proverb. Usage of Kannada on computers, like all other Indian languages, started with printing and publishing, popularly known as Desktop Top Publishing (DTP). The biggest challenge on those days was to display and print the characters of our languages. It was our own Kannadiga, K P Rao, who for the first time started designing fonts for Indian languages, including Kannada. He also created an inputting mechanism for feeding Indic characters into computers. Indian languages are highly scientific in nature. K P Rao utilized this fact and devised the first phonetic keyboard driver for Indian languages. Later on he released a free software for Kannada called Sediyapu. Then came so many DTP packages for Indian languages. All these were nothing but collection of fonts and keyboard drivers. Every vendor used his own proprietary encoding scheme leading to a sort of chaos. Files created using a particular vendor’s font was not readable using another vendor’s font. There was lack of standardization. Govt of Karnataka (GoK) took the initiative in standardizing Kannada on computers. It constituted a committee. As per the recommendations of the committee it notified the standard font for Kannada and a keyboard layout (2001). This layout is nothing but slightly modified layout of K P Rao. GoK also released a free software by name Nudi adhering to the standards. Kannada is not far behind in entering the information super highway (Internet). Vishva Kannada (www.vishvakannada.com) is the first ever web-site as well as online magazine in Kannada. Those days people who put up Indic web-sites were giving fonts for download whish has to be installed in the PCs to browse the web-sites. Then came the dynamic font technology wherein the font stays on the server and there is no need to download and install the font. Vishva Kannada is the first Indian language web-site to use dynamic fonts (1998). In the area of education and using IT, Kannada has made a mark. GoK’s Mahiti Sindhu program and Azim Premji Foundation’s computer aided educations are good examples here. Teaching the programming logic in Kannada and thereby developing programming skills is another important aspect which can be implemented by using Kannada version of LOGO program which is available at vishvakannada.com/KannadaLogo. This is first ever Indian language version of world famous programming language for children –LOGO. Kannada Logo has been blessed with Manthan Award. It was very cumbersome and next to impossible to create applications in Kannada like salary bill generation using the font and keyboard driver technology. The operating systems do not understand these fonts. This problem is now vanished with the advent of global standard called Unicode. Unicode removes the need for a font standard. Since the operating systems can now understand the data as Kannada, it is possible to sort as per Kannada sorting order and create database applications. These are made possible by the availability of Kannada Unicode enabled OS (Windows XP), Office suite, database and development tool (VS.NET) by Microsoft. 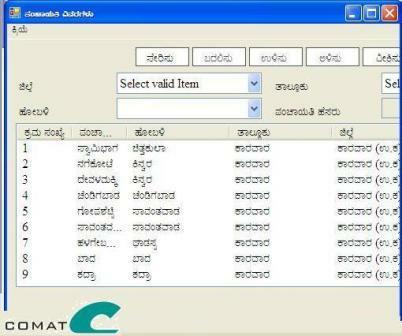 The famous Bhumi software of GoK, Ration card application created by Comat Technologies for GoK are some pioneering examples of Kannada applications. All the technological constraints in implementing Kannada on computers and developing applications for Kannada have been removed. Only remaining hurdle is the mindset of the people which is impeding the use of Kannada on IT.